I am so happy to be hosting my family for Christmas this year. Not only is there no travelling for my own family, but there will be lots and lots of Christmas cooking and baking in my future. I absolutely love hosting people, and one of the ways I show my love the most is through the food I bake and cook. 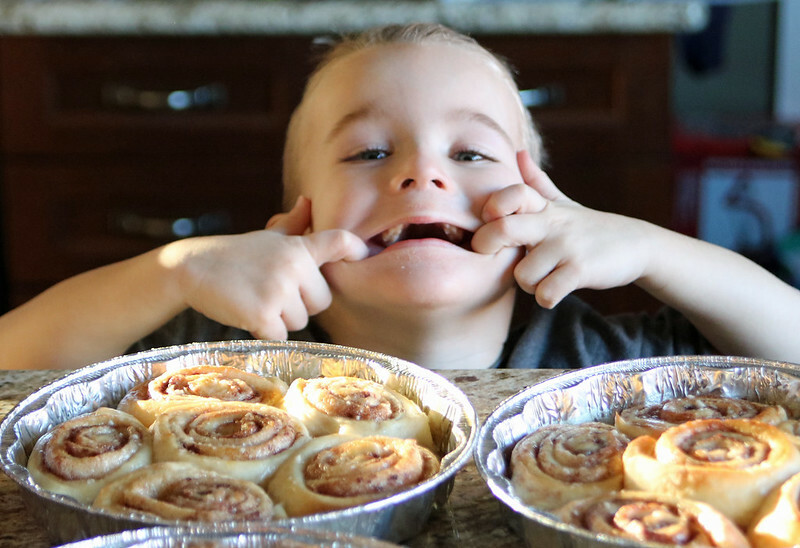 For the last few years, Ethan and I have made cinnamon buns for our neighbours and family to show the love during the holiday season–he’s my helper man in the kitchen. I get messages of thanks from our neighbours and it warms my heart and teaches our boys the wonderful lesson of giving too. We have five milk lovers in our family of five, so my fridge is always stocked with two 4-litre jugs of 2% Canadian Quality Milk for us bigger people and one 4-litre jug of Canadian Quality whole milk for the littlest guy. Milk is on our table at every single meal and is used in my kitchen for so much of my baking and cooking, and the holiday season is no exception. I need to make sure that my fridge is stocked with extra milk this time of the year, it’s a part of the holidays for us, that’s for sure! One of the most important ingredients in our cinnamon roll dough is milk and it’s the key element in the icing too. 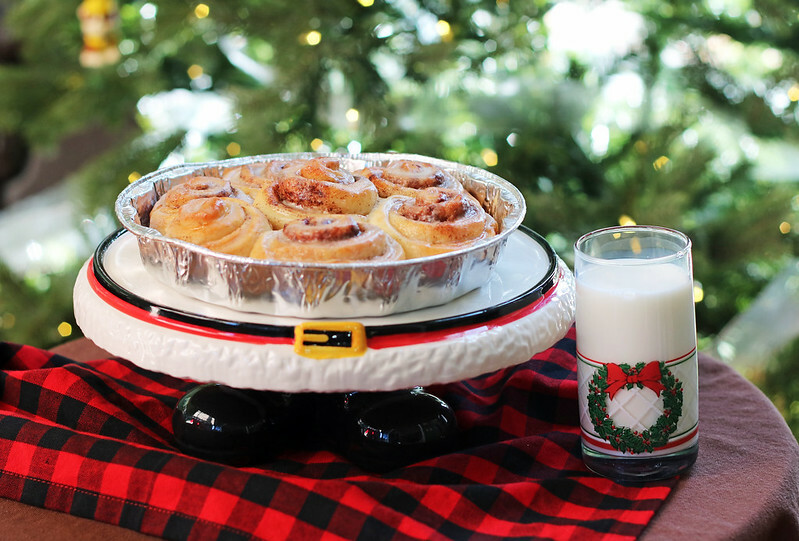 We also can’t forget a tall glass of cold, Canadian Quality Milk to go with our cinnamon rolls. This is my tradition with Ethan, and I hope during the holidays he’ll always be willing to bake these with me and deliver them to our neighbours. Who knows, maybe I’ll even still be doing this with Ethan’s kids one day? I sure hope so. I would love for this milk-inspired holiday tradition to continue for years to come. Be sure to check out the above video, your kids will love it too, and you’ll have the song in your head all day! Raise your delicious and refreshing glasses of milk, don’t forget one for Santa too! Check out the other great videos on Dairy Farmers of Canada YouTube page, and cheers to you and your family during this holiday season! 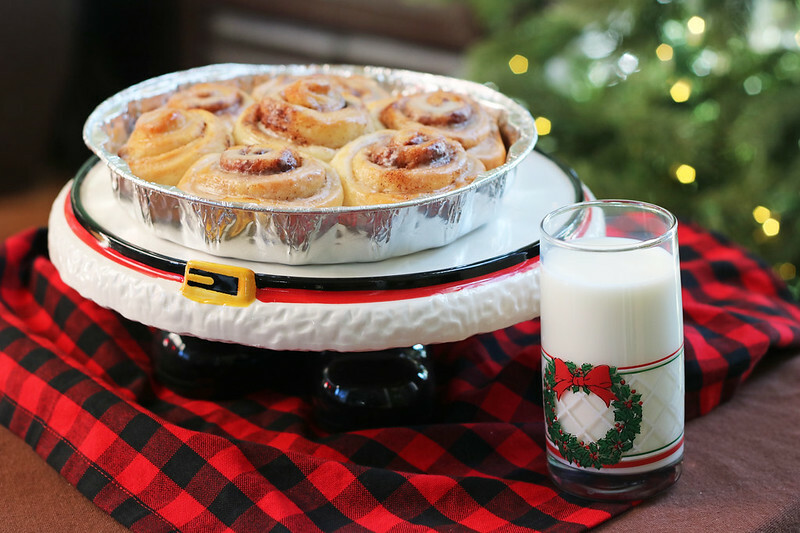 We go big or go home and love to modify this recipe because it makes about 7 round pans of cinnamon rolls to share with our neighbours and family. To make the dough, heat the milk, canola oil and sugar in a large saucepan over medium heat, making sure not to let it boil. Set aside to cool until lukewarm; then sprinkle the yeast on top and let it sit on the milk for 1 minute. Add 8 cups of the flour and stir until just combined (it will be rather chunky looking), cover with a dish towel and set aside in a fairly warm place for about an hour. After the hour, remove the towel and add the baking powder, baking soda, salt and the last cup flour, stirring thoroughly to combine—it will get hard to stir, but you can do the rest with your hands if you’d like, that’s what I do. Remove half of the dough and roll it out into a large rectangle so the long side is facing you. Now for the filling! Pour ½ cup of melted butter, or more as you desire, over the surface of the dough. Use your fingers to spread the butter evenly. Generously sprinkle half of the cinnamon and half a cup of the sugar over the butter. Again—if it doesn’t seem like enough sugar or cinnamon, add more—I won’t judge! Using both hands slowly roll the dough from one long end to the other, keeping the roll tight. Some filling might spill out, but that’s okay! Do your best to pinch the seam together when your long roll of cinnamon is at the end. Transfer to a cutting board if you desire, or if you have granite like we do, I carefully help Ethan use a pastry cutter to make 1½ inch wide slices. Pour enough melted butter into several pie pans or round baking dishes and swirl to coat, about 2 tablespoons each. Place the rolls in the pans, 1 in the middle and then about 5-6 around it, depending on their size. Do this exact same thing with the other half of the dough and filling ingredients. 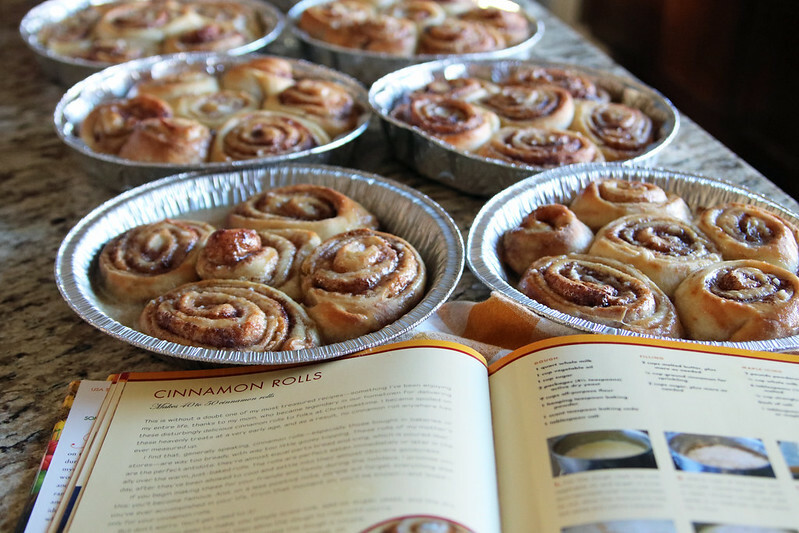 Preheat the oven to 375ºF and cover the cinnamon roll pans with dish towels and let rise for at least 20 minutes before baking. Remove the towels and bake for 20-25 minutes, depending on your oven, until golden brown and not doughy in the centre. While the rolls are baking, you can make the delicious icing by whisking together the milk, icing sugar, butter, coffee and salt in a large bowl. Then add in the maple flavoring and whisk until very smooth. Taste, and add more sugar, butter or other ingredients as needed until the icing reaches the desired consistency. The icing should be thick but still pourable. While the rolls are still warm, generously pour icing over the top, edges and sides of the rolls which will absorb some of the icing as they sit! Yummy! We like to simply wrap them with tinfoil to keep them warm and deliver right away to our neighbours. If our neighbours aren’t home, we leave them in the entryway so they can come home to the smell of warm cinnamon rolls! 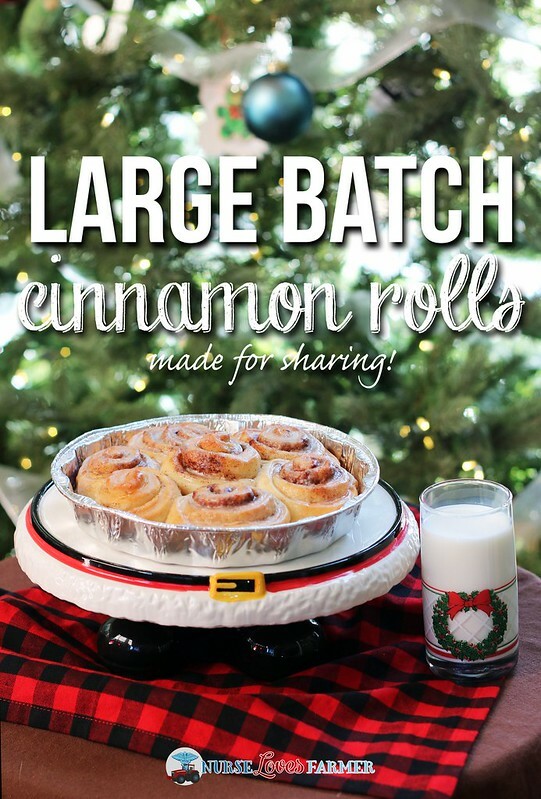 If you're going to make cinnamon rolls, you might as well make a large batch and share the yumminess! To make the dough, heat the milk, canola oil and sugar in a large saucepan over medium heat, making sure not to let it boil. Set aside to cool to lukewarm; when it is lukewarm, sprinkle the yeast on top and let it sit on the milk for 1 minute. Add 8 cups of the flour and stir until just combined (it will be rather chunky looking), cover with a clean dish towel and set aside in a warm place for about an hour. After the hour, remove the towel and add the baking powder, baking soda, salt and the last cup of flour, stirring thoroughly to combine---it will get hard to stir, so at this point I like to use my hands. Remove half of the dough and roll it out into a large rectangle so the long side is facing you. For the filling, pour ½ cup of melted butter, or more as you desire, covering the entire surface of the dough. Use your fingers or a pastry brush to spread the butter evenly. Generously sprinkle half of the cinnamon and of the sugar over the butter; adding more as needed. 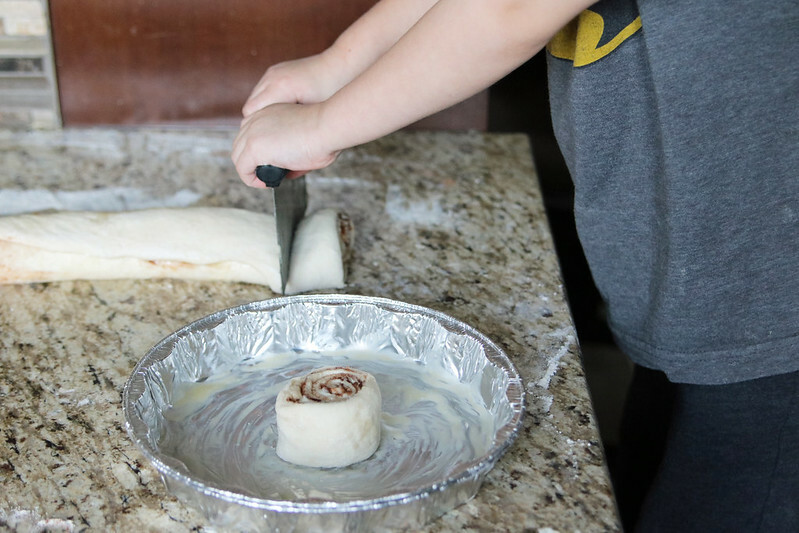 Using both hands slowly roll the dough from one long end to the other, keeping the roll tight and forming a long log of cinnamon rolls. Some filling might spill out, but that's okay! Do your best to pinch the seam together when your long roll of cinnamon is at the end. Transfer to a cutting board if you desire, or if you have granite like we do, I carefully use a pastry cutter to make 1½ inch wide slices. Pour enough melted butter into several round baking dishes and swirl to coat, about 2 tablespoons each. Place the rolls in the pans, 1 in the middle and then about 4-5 around it, depending on their size. Do this exact same thing with the other half of the dough and filling ingredients. While the rolls are baking, you can make the delicious icing by whisking together the milk, icing sugar, butter, coffee and salt in a large bowl. Then add in the maple flavoring and whisk until very smooth. Taste and add more sugar, butter or other ingredients as needed, until the icing reaches the desired consistency. The icing should be thick but still pourable. While the rolls are still warm, generously pour icing over the top, edges and sides of the rolls. They will absorb some of the icing as they sit! Yummy! 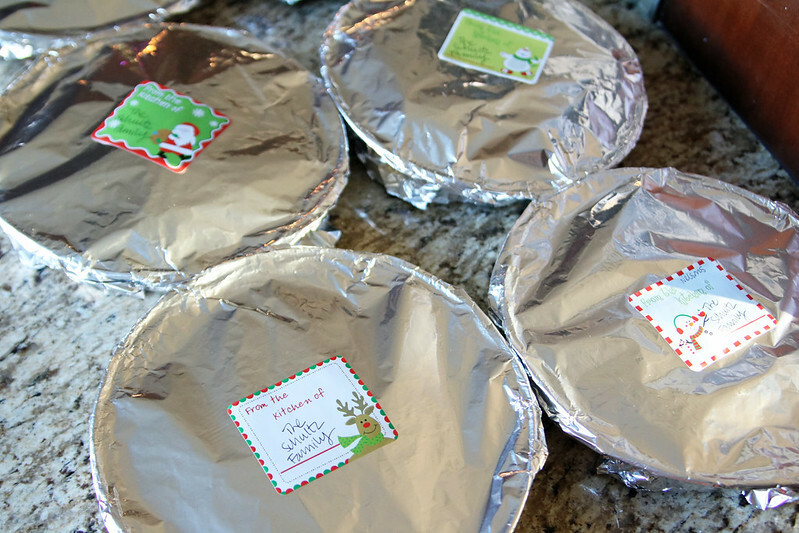 Cover with tinfoil and deliver to your family & neighbours, be sure to keep one for yourself! I hope you enjoy this recipe, that you get a chance to bake some and share with your neighbours too, and enjoy this wonderful time of the year! Disclosure: I never work with brands that I do not genuinely love and haven’t used myself. This post is generously sponsored by Dairy Farmers of Canada in partnership with Food Bloggers of Canada, and all opinions on this blog are my own.